Reading books like this makes me glad that my education forces me to pick up books I wouldn’t even know existed otherwise. The Harvard Education Review says that “Other People’s Children provides an important, yet typically avoided, discussion of how power imbalances in the larger U.S. society reverberate in classrooms.” And how! 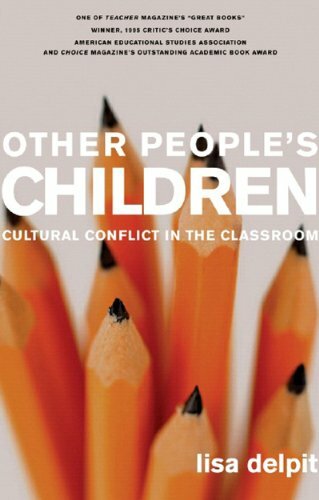 Other People’s Children is a collection of essays written by Lisa Delpit, a black scholar dedicated to improving the treatment of children of color in classrooms. One thing to be said for Delpit is that she doesn’t beat around the bush–she’s quick to identify the problems in today’s mono-cultural educational approach, using personal interviews, educational research, and statistics as just a few of the pieces of evidence that the U.S. educational system is in need of an overhaul. And she’s a good point. Several of them, actually. For example, in the U.S. public school system, “minority” children (African-American, Hispanic, Asian, etc.) currently make up about 40-45% of school’s populations. It is projected that within 10-20 years, white children will become the minority in schools. Therefore, Delpit draws the valid conclusion that with so much of the school-age population being unjustly underserved, something must be done. While Other People’s Children does a fine job explicating the problem, I found that few concrete solutions were offered; much of the book felt like killing a dead cat nine times more. But, I have to give this book a high rating, because it will forever change the way I view education and the type of educator I want to be. Delpit’s frank style made me view my own upbringing in a dominantly white, middle-class community in a new light; I recognized aspects of my culture that I had never noticed before. For example, in typical white, middle-class culture, children are taught from a young age to “verbally mediate any action [because] the action itself is not evidence of its existence–it must be put into words” (99). As an example of the above principle, Delpit stated a videotaped example of a child falling down and crying; in response, one of the parents said, “Aw-aw, poor kid…What tripped you, did you see what tripped you?” (100). Delpit stated that this teaches kids that crying or any other reaction is “inappropriate unless it is accompanied by a verbal explanation” (100). Considering the society I grew up in, I assumed that this wasn’t too bad of a skill–it just means that we’re adept at verbally putting into words our reactions and our views of the world around us. However, Delpit points out that this kind of thinking means that an adequate performance on a task is not enough; she says that it creates the idea that unless someone can verbally explain how they solved a problem or completed a task, the performance doesn’t count. Ultimately, she argues that this leads to decontextualization, which means learning to just see words and ignoring context. It also leads us to trust more in textual “authority sources” instead of trusting in ourselves and in our own instincts, such as is taught in Native Alaskan communities. Previous ArticlePhoto Walk – Beauty in January? Why Yes!